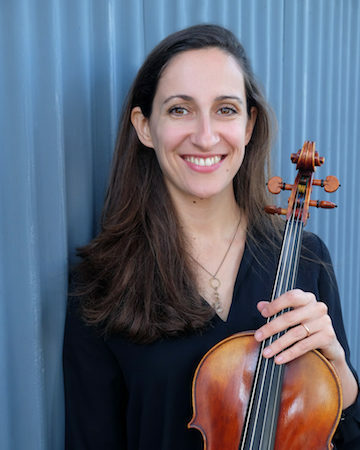 The French violist Virginie d’Avezac began her musical studies with the Piano at the age of 5 and entered the Bordeaux National Conservatory at the age of 10. At 14, she found her true musical calling and began studying the viola. She received first prizes from the Bordeaux Conservatory in viola, chamber music, harmony and counterpoint. Virginie studied with two of France’s most respected violists, Tasso Adamopoulos and Serge Collot. She has played in many prominent orchestras across France and North Africa, including the National Orchestra of Ile de France, the National Orchestra of Bordeaux, the Youth Orchestra of the Mediterranean and the Philharmonic Orchestra of Morocco. For 6 years,Virginie was professor of viola and violin at the Cognac Conservatory of Music and was the conductor of the school’s string orchestra. An avid chamber musician, Virginie performs regularly with the pianist Zachary Deak. In September 2012, the Magnolia quartet of which she is a founding member, was admitted to study at the prestigious European center of chamber music, Proquartet, in Paris. They have participated in Master Classes and received encouragement from such musical figures as Guy Danel (Danel quartet), Vaclav Remes (former first violin and founding member of the Prazak Quartet), Eric Robberecht (violin solo of “la Monnaie” symphony orchestra in Brussels), Günther Pichler and Valentin Erben (Alban Berg quartet), and Louis Fima (Arpegione quartet). Since her arrival in Los Angeles in February 2016, Virginie has been playing with Kaleidoscope, Lyra Chamber orchestra and the LA Jewish Symphony and she has joined the String Mob ensemble for several music scoring. She is also the new principal viola of Bakersfield Symphony Orchestra and a new violin/viola teacher at the Santa Monica Conservatory. Interested in many different styles of music, Virginie has performed with pop singers as Rivkah, Baden-Baden and Marie-Flore, the Malagasy artist Erick Manana, the tango group Tengo tango, and the French rock singer Hervé Esno.